A free tarot cards reading service and political thought/ interpretation for all, also a MAJOR ARCANA tutorial Series. Color Protest. but this post is especially for pregnant women and new moms. I have noticed that a lot of articles have been written in a variety of topics especially in the topics of love and money but not many have been written about tarot and pregnancy. As a matter of fact in the entire tarot we have only one card depicting a preganant woman and that is of course the Empress. When I was pregnant I spent a lot of hours with tarot for comfort and pampering and I often use it as tool to lessen my anxiety because of all my fears regarding giving birth, choosing the right birth method, choosing my baby' s best birthday and most suitable name. The Empress is a card about caring and mothering, planning a family. When pregnant, women are restricted from a lot of things, especially drinking and smoking, partying and even doing excessive sports. Their whole life is full of questions such as how my baby will look like? will my baby be healthy? will the giving birth be painful or complicated? what name will be best for my child? Tarot can help and offer valuable answers to all these questions. My advice is.. do not take any risks while pregnant because the health of your baby is the most important thing. The incredible thing is that the time you spend with yourself while preganant is the most valuable because it gives you the opportunity to reflect on important decisions you will need to take once the baby will be born. Tarot can be the best tool for managing and planning your life if used correctly. In the upcoming posts I will be showing you how to reflect with the cards on important decisions regarding your new baby and how to use Tarot for "company" and "friend" for your time alone. In the image above the Duck Soup's Trick or Tarot Empress card. I must confess giving readings is not what excites me about tarot. In fact,giving readings feels more like a job rather than a passion. I also am conflicting about giving readings in the biblical sense, because the Bible teachings warn against sorcery, so I decided to find a way around it that will give me piece of mind. I believe that reading the future for others, for a profit may be unethical from my point of view. Therefore, I decided to teach tarot and write about tarot only. I have noticed a lot of interest in the blog on the post about my writing a tarot book goal. Fortunate enough I am a point where I work 5 hours a day only and I have the rest of the day for myself and for my son s care. So GOOD NEWS: I can work on the tarot book I have been wanting to write for quite some time now. I will post in this blog a few chapters of my work in progress for feedback. If you have any other topics you may be interested in please communicate those to me and I just might take them into consideration if they appeal to me. Now I finally present you which of the Court Cards are dating, attracted to each other or just envious of the other Tarot Court Cards. Please note my findings are based and inspired by the Tom Little's and Mary K Greer's Understanding the Tarot Cards book. #1. King of Coins, Colonel Brandon and Queen of Swords, Anne Elliot are in a relationship. Why not? Colonel Brandon is ready to come in and rescue any young lady in financial trouble, and Anne Elliot is a well accomplished lady in need of such assistance. They are also close in age and I truly believe they make a nice couple. 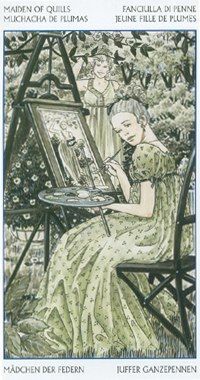 #2 Queen of Wands, Elizabeth Bennett and the Knight of Wands, Mr Henry Tilney are flirting with each other, but the Knight of Wands (Mr Tilney) is also having an affair with the Page of Swords, Emma Woodhouse. Lets just say that the Queen of Wands is Aries who is naturally attracted to the Knight of Wands, a Leo. Astrologically speaking those two are a good match. As far as the love affair of the Knight of Wands with the Page of Swords I will leave it for you to comment on this below. 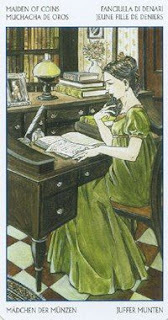 #3 The King of Wands, Captain Wentworth is seeing the young and vulnerable Page of Cups, Marianne Dashwood, who is just starting dating. 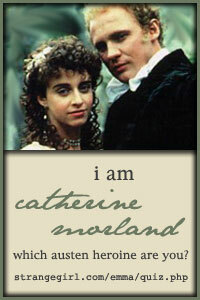 #4 The King of Swords, Fitzwilliam Darcy and the Queen of Cups, Jane Bennett are attracted to each other. And this is true, because we already know from Pride & Prejudice story that Mr Darcy is considering Jane Bennett more attractive than Elizabeth Bennett at first, and the only reason he is not pursuing her is because his friend, Mr Bingly already showed an interest in her. #5 The Knight of Cups, Mr. John Willoughby longs after the Queen of Cups, Jane Bennett but she has no interest in him. Mr Willoughby is an incurable charmer and he is especially pursing the sensitive cups lady, but she is mature enough to see through him, and beyond his shallow charms. #6 Page of Wands, Lydia Bennett and the Knight of Coins, Mr Edward Ferrars are having a platonic relationship. Lydia Bennett is a born flirt but Mr. Edward Ferrars is rather reserved, and very shy, completely unable to pursue a relationship with the daring Lydia. Therefore, their relationship stays platonic. #7 However, the Page of Coins, Charlotte Lucas is jealous at the Knight of Coins, Mr Ferrars. #8 King of Cups, Mr Charles Bingley and the Queen of Coins, Elinor Dashwood have a marriage of convenience. 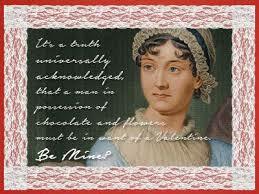 Elinor Dashwood is calculated and unfeeling enough to settle for a man of fortune, such as Mr. Bingley. #9 The Knight of Swords, Frank Churchill is single and jealous at all the other couples. This concludes the Valentine Court Card Matching, if you want to leave comments below you are welcome to do so... and please feel free to express who you see as a couple or not. 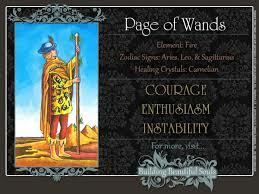 I am very enthusiastic about today' s big day of final reveal of the couples in Tarot Court. Now, you can read further to the next post where I will reveal inspired by Mary K Greer's and Tom Little's Understanding the Tarot Court book who is coupled with who, and who stays single this Valentine Day. in previous posts I wrote about the Pages of Wands, Cups and Swords and now I will present you the fourth Page, the Page of Coins. 4. Page of Coins or Maiden of Coins in Jane Austen Tarot is Charlotte Lucas of Pride and Prejudice. - an opportunity to make money: financial opportunity. There will be no further tarot court cards added to the blog, but you can receive those on demand by writing in comments or emailing me directly. On Valentine day will be the big reveal on this blog who gets coupled with who, and who stays single. 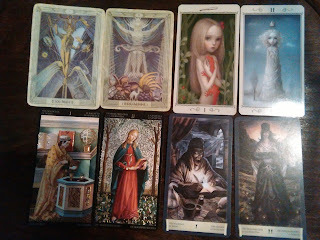 So, far I covered in previous posts Pages of Wands and Cups in parts 1 & 2 of Valentine Matching- Pages Tarot Court. Please go back and read about those if you did not have a chance to do so yet. 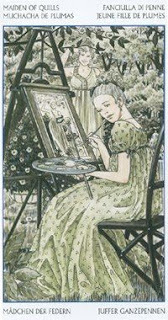 In Part 3 I will present the third bachelorette, the Page of Swords or the Maiden of Quills in Jane Austen Tarot. new tarot solutions blog vs old tarot solutions blog. the Magician can be a woman or a man. As you all know readings are free, but small monthly donations are recommended for supporting this site. NOW just click on the paypal donate button. send me an email at and I will do a reading for you. 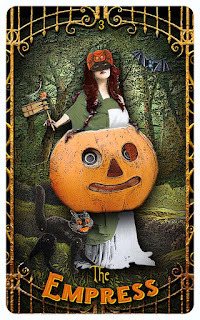 I am a tarot blogger since 2009 and I use tarot cards to tell stories and to journal. I am enthusiastic, a free spirit and I lived in the US for 20 years (moved back home) and traveled already to many countries. I am very creative, unpredictable and an excellent observer that uses interdisciplinary subjects to communicate ideas/ to convey emotions/ to prompt actions and to manifest desires- in this sense I am female magician. I am searching for friends with a shared interest in spirituality and psychic development. Together we can open our senses, mind and heart to possibilities of good fortune. This came out so true! In fact it discribed me so closly I decided to put it under my profile. I encourage you to take this test.